Experiencing the making of a broadside ballad (and, for this particular node of the project, the creation of a woodcut) offers a unique opportunity to theorize and historicize what is often, for literary scholars, obscure: the creative process that results in the objects that we study. I propose in this essay to offer my own analysis of the historical process of creating a woodcut, enhanced by my own physical experience with tools and blocks. Accordingly, this essay will begin with my personal experience in the creation of a woodcut, performed at first on a linoleum block. I will then move to a discussion of the broader history of the woodcut, from its earliest ties to printing to its use in the sixteenth- and seventeenth-century broadside ballads that constitute the focus of this larger project. I will specifically turn to aesthetic questions as a means of discussing the larger implications of woodcuts, both as crafted, artistic artifacts and as cogs in the machine of broadside ballad production. Finally, marshaling the weight of personal experience, historical background, and aesthetic inquiry, I will return to my experiences with carving, this time on actual woodblocks, under the guidance of historic preservationist William Palmer. My experience with the history, especially with the practice of woodcutting, has offered insight into the utility and artistry of woodcut impressions in ballads: even the crudest of impressions represents hours of work on behalf of the artist and carver, and is the end result of intensely physical labor. 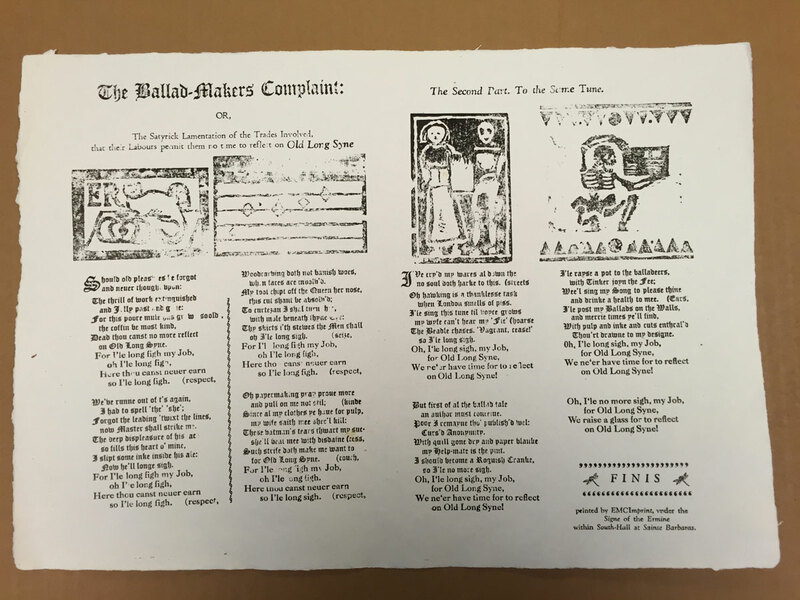 This labor and its resultant artistry offer a commentary on the social value of images in early modern Britain, as well as the scholarly value of serious reappraisals of broadside ballad images. 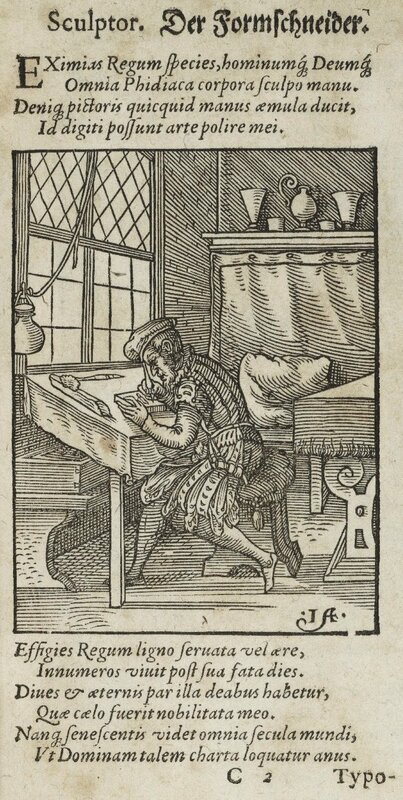 Figure 1: Image of a woodcutter from Hartmann Schopper’s Panoplia Omnivm illiberalivm mechanicarvm aut sedentariarum artium genera continens, 1568. In anticipation of working with woodblocks, I bought two linoleum blocks and some linoleum carving tools with which to experiment, hoping to familiarize myself with the physical process of carving woodblocks for the printing press. My work with the English Broadside Ballad Archive (EBBA) has familiarized me with the often repetitive use of woodcuts in broadside ballads. I began with a blank block of linoleum and a rather simple question: how does one get from a blank block to the sort of impression I’ve seen on thousands of ballads? I tried as much as possible to occupy the role of the woodcutter, the “sculptor” or “blockcutter” emblematized by Jost Amman’s woodcuts for the 1568 edition of Hartmann Schopper’s Panoplia Omnivm illiberalivm mechanicarvm aut sedentariarum artium genera continens (Figure 1). Woodcuts could be designed in a number of ways. Often the artist painted a thin coat of white paint onto the block to increase the visibility of the artist’s design and then drew the image to be carved directly onto the woodblock. I began with my canvas, a blank linoleum block, and my carving tools (see Figure 2). 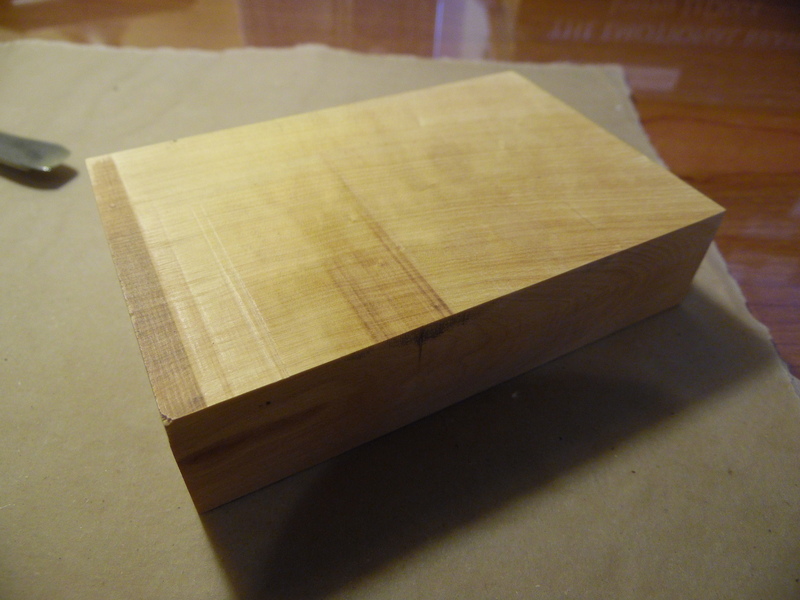 I chose a large block to start with—six inches by four inches—to aid in introducing myself to the carving process. I chose to work with an image of the Tudor rose that I found online; it was simple and had thick lines, which seemed appropriate for an amateur woodcutter like myself (Figure 3). Additionally, it was a design that may be seen on ballads, and that also invoked the type of nostalgia often depicted in ballad illustrations. In this case, the Tudor rose hearkens back to the rulers of the century prior to that of the heyday of seventeenth-century broadside ballads, especially to the reign of Queen Elizabeth I: a time of (relative) monarchical and governmental stability. and traced the lines with a black pen; the result can be seen in Figure 6. I connected the dots with the black pen directly onto the surface of the block, and ended up with the transferred image shown in Figure 7. The white portions of the image were the sections that would be carved away (although, as I will explain, the finished product would vary slightly from the original image, as I had to modify and adapt my design as I worked to create a more structurally stable image). I took up my tools, and began to gouge out sections of linoleum, beginning with the outline (see Figures 8, 9, and 10). I then continued to make cuts, although I ended up leaving two layers of petals uncarved, both for contrast and because the integrity of my cut was at stake: the thin lines I was leaving uncarved were structurally weak, and needed some larger uncarved segments to bolster them. As can be seen in Figure 11, when I was cutting the outer right edge of my rose, my carving tool slipped and took the delicate line of a petal with it, leaving me with an imperfect woodcut (a common issue for early modern woodcarvers as well, as I will discuss below). In spite of the errors, the block itself is interesting, and its simplicity belies the hours of work that the execution of this simple design required, although some of that time was undoubtedly due to my inexperience as a carver (see Figure 12 for a detailed image of the completed cut). Finally, I was ready to “print” my woodcut. I first attempted to use a stamp pad to ink the block, but the ink was far too thin and wouldn’t cover the block. I ended up making do with what I had at hand: black craft paint. Although the impression was crisp and dark, the modified “ink” was a bit too thick. I smudged the ink with my finger in the lower left corner of the rose, and the linoleum pulled away at the paint, leaving streaks in the impression—not quite the same as an imperfectly inked block printing onto a broadside, but still exposing yet another level at which errors could occur in the process of making and printing a woodcut (see Figure 13). Although performed on linoleum, the preceding process was illuminating in a number of significant ways for thinking about the woodcut. Even granting the fact that a linoleum block is far easier to carve than a plank of boxwood (one of the preferred media for early modern woodcuts precisely because the wood is hard and has a longer life under the repeated pressure of the press), the process itself was still rife with difficulties. First, it was time-consuming: the simple design I chose took nearly three hours to plan, transfer, and carve into the soft linoleum. Although the linoleum was quite pliable, it was still resistant to the carving tools, causing them to slip a number of times, once taking the line of a petal with it. I struggled to find the best way to control my carving instruments. Control is key with the woodcut process, as is a steady hand, and confidence in making a cut. In woodcutting, each cut is irreversible. Adaptability is paramount: one has to either work with one’s mistakes or ignore them. Early woodcutters addressed errors in a range of different ways—sometimes carving around a mistake, changing the image entirely, or cutting out the error and plugging it with a clean piece of wood. Carving was also a physically taxing process: I was bent over a small block of wood for several hours, using unfamiliar tools and squinting at my image. I cut myself with a slipping tool several times, which I imagine could happen even to an experienced woodcarver. Overall, the physical process of making a woodcut offers interesting insight into the woodcut impressions that populate broadside ballads. Though an experienced woodcutter would surely have proceeded more efficiently than I did, he or she would have been working with harder-to-carve wood, not linoleum. So even if we grant that the woodcarver could reduce my time by a third, two hours is a significant amount of time to spend on cutting a single very simple (and defective) rose. Even the worst impressions, one must conclude, represent hours of very physical labor for the woodcutter, which might help to explain why subpar woodcuts would have been used and reused in spite of their relatively poor quality. Furthermore, the artistic endeavor of making the woodcut is not nullified, it would seem, by a poor end result; the cut still appears to resonate with its viewers, and therefore to fulfill its artistic purpose, as is evident in the many poorly cut, worn, and worm-eaten woodblock impressions that adorn extant broadside ballads. In fact, it was the images that drew many people (literate and otherwise) to broadside ballads; Samuel Pepys, in his collection of ballads, laments the disappearance of “pictures” around the year 1700, “When the Form, till then peculiar thereto, viz.t of the Black Letter with Picturs, seems (for cheapness sake) wholly laid aside, for that of the White Letter without Pictures.” The quality of the images, however dubious, represents an artistic and social dimension of broadside ballads and their accompanying images, which makes it possible to acknowledge their occasional crudity and still appreciate their artistry and significance to early modern English society. Figure 14: Woodcut impression from British Library Roxburghe 2.45; EBBA 30272. In Figure 14 we encounter a simple shepherdess in Restoration dress. 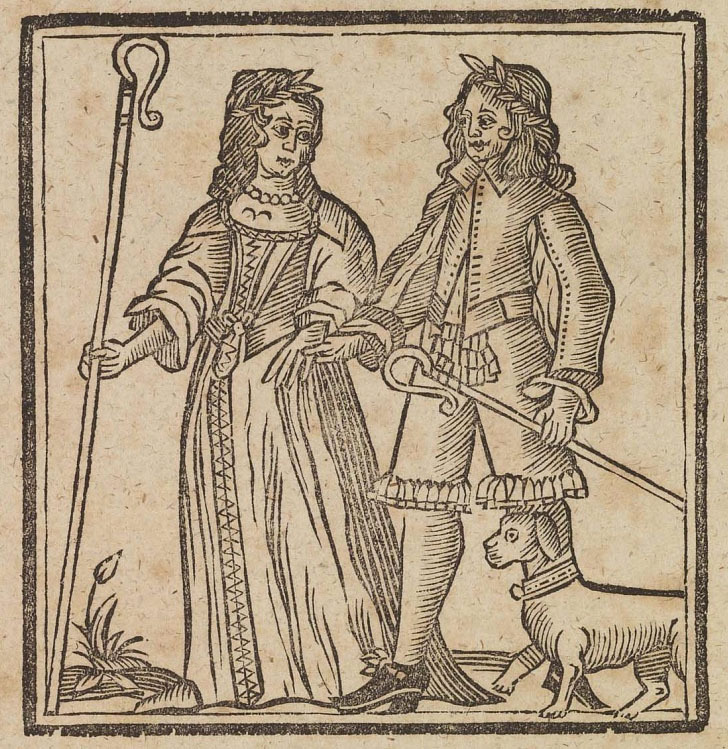 She is a popular woodcut impression, representing, among other figures Celinda in “Celinda’s last Gasp: OR, Her Farewel to False Coridon,” Isabella in “The Westminster Lovers,” Flora in “The Supriz’d Shepherdess,” Aminta in “Love and Constancy United: Or the Languishing Lady made Happy,” and a slew of other shepherdesses, both named and nameless. 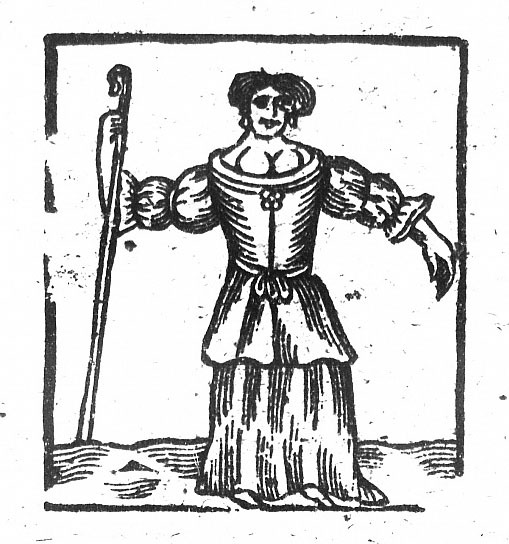 Although this woodcut is clearly a popular image, it is also clear from the impression in Figure 14 that the image is not particularly realistic: Celinda has strange hair, a thick neck, breasts beginning at her throat, shoulders unusually broad for a woman, and arms at odd angles. Compare Celinda to Caelia, another Restoration shepherdess, pictured in Figure 15 with her lover Amintas from “AMINTAS, Or, The constant Shepherds complaint.” Although Caelia is also arguably lacking in realistic detail—she suffers from ill-formed hands and unusually shaped breasts, and is wearing quite nice clothing for a simple shepherdess—she is much closer to a modern aesthetic norm than Celinda is. Figure 15: Woodcut impression from National Library of Scotland Crawford 211; EBBA 33154. I bring up Celinda and Caelia because no discussion of woodcuts in broadside ballads (and indeed in English printing history) is complete without noting that impressions in ballads are often dismissed as “crude and primitive,” according to Patricia Fumerton and Megan E. Palmer, in “Lasting Impressions of the Common Woodcut” (5). Tessa Watt, whose groundbreaking work on broadside ballads in Cheap Print and Popular Piety pays great attention to the details of ballad illustrations, notes that the English woodcut "was a relatively underdeveloped art” (132). And yet, experimenting with the woodcut process grants insight into the artistry of even the crudest of images, such as those of poor Celinda, and calls for a renewed appreciation of their social and artistic significance. The English woodcut historically has been seen as greatly inferior to those produced on the continent. William Caxton’s 1481 edition of Myrrour of the worlde is usually cited as the first book to prominently feature woodcuts, according to Edward Hodnett's English Woodcuts 1480-1535. Yet Hodnett states that “England stumbles on to the book-illustration stage with some of the poorest cuts ever inserted between covers,” echoing the sentiment that English woodcutting was a cut below the woodcuts of the rest of the world (1). Compared to their continental counterparts, English woodcutters may have been subpar, but such scholarly judgment assumes that woodcuts in the continental style were the pinnacle of woodcutting art, and that the aesthetics of continental woodcuts were somehow superior to those of the English without giving consideration to cultural and social differences that may have demanded a different style in England. Both in England and on the continent, woodcuts began with planks of wood, often boxwood or pearwood, both of which were soft enough to carve but durable enough to withstand the intense pressure of repeated runs through the printing press. According to Arthur M. Hind, in An Introduction to a History of Woodcut with a Detailed Survey of Work Done in the Fifteenth Century, the blocks were “generally about 7/8 in., i.e. a size which will print conveniently in conjunction with type” (12). That is, they are “type-high,” roughly the same height as a piece of metal type. However, given inconsistencies between blocks and type, and between notions of “type-high” in various areas of the world before standardized type-height was introduced, blocks must often have been augmented in some way, possibly by adding a thin wooden backing to the block, to enable them to be printed at the same time as the text of the broadside. On the other hand, it is also possible that woodcut impressions were printed separately from the metal type, requiring a broadsheet to be run through the press twice. Woodcuts could be designed in a number of ways. Often the artist painted a thin coat of white paint onto the block to increase the visibility of the design, then drew the image to be carved directly onto the woodblock. Designs could also be transferred by a number of methods, including pasting the design to the block and carving through the paper (a cruder version of my “pricking” method). The pasted paper, however, inhibited the process of carving (Landau and Parshall 22-23). Hind posits that the artist who designed the woodcuts and the woodcarvers who cut them out were not always one and the same; in fact, for Hind, the cutting of the woodcut “might be said to possess no artistic virtue” in comparison with the artist’s drawing (an attitude clearly maintained by many scholars of early modern print). But Hind fails to consider the skill needed to use the woodcutting tools. The main tool used in woodcutting was a knife with a beveled edge. A tool called a graver was also used, which could take a number of different forms, some having rounded channels that would make larger, shallower gouges, some with sharp V-shaped tips that would produce a fine line. The skill and attention to detail required of a woodcutter to wield the knife and graver to carve out a tiny image undermines Hind’s contention that the woodcutters were not skilled artists and of the same caliber as the artist who drew the image; my own experience has demonstrated Hind’s assertion to be manifestly untrue. Instead, in the creation of a woodcut, the line between artist and craftsman dissolves in the face of the complex carving process. Once the carving was completed, woodcuts would be put into place in the press bed (or coffin) with the rest of the type, and stabilized with furniture. They would be covered as evenly as possible with thick ink from ink dabbers (large ball-shaped pads made from sheepskin stuffed with wool) and run through the press. For broadside ballads in particular, woodcuts would almost certainly be placed on the press along with the type, as opposed to being added during a second run through the press, despite some contention to the contrary. This means that all broadside ballad woodcuts, as noted above, must have been type-high, or made to be type-high through paper or wood insertions. These images (and their associations with various ballads) might be “decidedly rough,” as Franklin writes, but they nevertheless represent a serious artistic endeavor and sense of aesthetic value (after all, reuse is an endorsement of sorts) that is undervalued in current criticism (“The Art” 329). Behind such reuse and assemblage of viewer associations lies the artistry of the woodcut and its printed impression. These in turn result from the physical labor of the production of the original cut: painstakingly carved by the woodcutter, the image is birthed from the wood slowly, methodically, and with an intense focus on minute details, later to be appreciated by generations of viewers. Although each woodcut, no matter how crude, can be seen as an individual work of art, their repeated occurrence, as mentioned above by Franklin, points to a larger goal. The very purpose of the woodcut is to reproduce itself as many times as possible before the cut decays irreparably. Furthermore, each reproduction is essentially a new product, as each printing alters the block in some microscopic (and occasionally macroscopic) ways. Each block is meant to be self-replicating, but the pressures of time and the press create a unique impression with every printing, freezing the image to reflect the block's current “state” at the moment of printing. The original block, then, is always in a state of instability and inevitable decay. I have, until this point, argued for the artistry inherent in the creation of a woodcut; but I have also conflated the woodcut itself with its printed image on a broadside ballad. If the artistry of the woodcut is evident in the labor involved in the production of the artifact, but the woodcut only exists to replicate its own image in paper, then scholars are presented with something of a conundrum: is the true work of art the progenitor of the printed image, or is it the printed image itself? I turn now to the aesthetic theories of Walter Benjamin to tease out this issue and to promote a theory of the woodcut as an assemblage of individual artistry and social communication. In “The Work of Art in the Age of Mechanical Reproduction,” Benjamin discusses the woodcut image as a “reproducible” work of art: “With the woodcut, graphic art became mechanically reproducible for the first time, long before script became reproducible by print” (1233). Like print scholars such as Hind, David Landau, and Peter Parshall, Benjamin links the advances of the woodcut to the advances of print. Benjamin goes on, however, to discuss what he calls the diminishing “aura” of the original upon reproduction: “Even the most perfect reproduction of a work of art is lacking in one element: its [the original’s] presence in time and space, its unique existence at the place where it happens to be” (1235, 1234). If we grant Benjamin his claim about the work's aura, generated from a work of art’s unique nature, his argument poses a quandary for the consideration of woodcuts. As I have noted, a woodcut and its impressions are linked. Benjamin might say they partake of the same aura; after all, printing a woodcut “put[s] the copy of the original into situations which would be out of reach for the original itself” (1235). But if the woodcut itself is never intended for public view, yet it is the source of the artistry of the impression (which is publicly visible on the printed page), which is the work of art? Benjamin anticipates this conundrum: “By making many reproductions it [the technique of reproduction] substitutes a plurality of copies for a unique existence. And in permitting the reproduction to meet the beholder or listener in his own particular situation, it reactivates the object reproduced” (1235). What Benjamin writes of the photographic print may also hold true for the woodcut: “[T]o ask for the ‘authentic’ print makes no sense” (1237). Yet, there is a striking difference between the print drawn from a photographic negative and the impression drawn from a woodcut. The woodcut, as I noted above, is always changing both microscopically and macroscopically in response to outside pressures, such as time, use in the press, and atmosphere. Therefore, a unique print is produced each time a woodblock is utilized in the printing bed. Perhaps, then, we can locate Benjamin’s aura—his idea of uniqueness—in both the woodcut (representative of hours of skilled, taxing labor by a woodcarver) and in the impression, which simultaneously captures the singular existence of the woodcut at the moment it is printed and situates the “copy” in a new context, surrounded by the text of a broadside ballad. Each impression, along with each stage of a woodcut’s development over time, is suffused with the auratic singularity that Benjamin describes. The woodcut and its impressions, then, should be considered an assemblage that provides a feedback loop of auratic characteristics: the woodcut lends artistry (and therefore aura and uniqueness) to the impression, but the dissemination of the impressions on broadside ballads invests auratic qualities into the original and into past and future impressions drawn from the same (or copied) woodcuts. Furthering this notion of the feedback loop between woodcut and impressions, Latour and Lowe ask, “What does it mean to enshrine an original, if the contemplation of its auratic quality is impossible?” (12). If a woodcut remains unseen by all but the printers, enshrined in a print shop, who will grant it aura? It would seem consistent with Latour and Lowe’s claims to argue that the aura of a woodcut, even a poorly-carved one such as Celinda, discussed above, is dependent upon the visibility of its impressions—that is, of its reproductions. Furthermore, the impressions owe their artistry to the original woodcut (and, of course, to time, change, and decay, which create a singular work of art with each impression). Therefore, my original conflation of woodcut and impression may actually be a more accurate way to consider the assemblage of the two art forms and their social functions. The history of woodcut impressions on ballads and their use by the public—as art objects, they were used to decorate the walls of homes, milking sheds, alehouses, etc.—seems to invest each individual reproduction with its own “unique existence” (that is, its own aura) as it “meet[s] the beholder […] in his own particular situation.” Reproducibility, in the case of broadside ballads, allows woodcut impressions (although not the original woodcut itself) to reach a wider public audience who invest its artistry and that of the ballad on which the impressions appear in their personal, everyday lives. Moreover, as Watt notes, the idea of ballads as “‘popular’ printed culture” belies the fact that they reached across the various strata of early modern English society: “Ballads were hawked in the alehouses and markets, but in the same period they were sung by minstrels in the households of the nobility and gentry […]. Pictorial themes which appeared in the crudest woodcuts were also painted on the walls of manor houses” (1). Woodcut impressions and the broadside ballads they adorned, then, seem to perform a unifying function for early modern society, communicating across time and social strata in defiance of crudity. 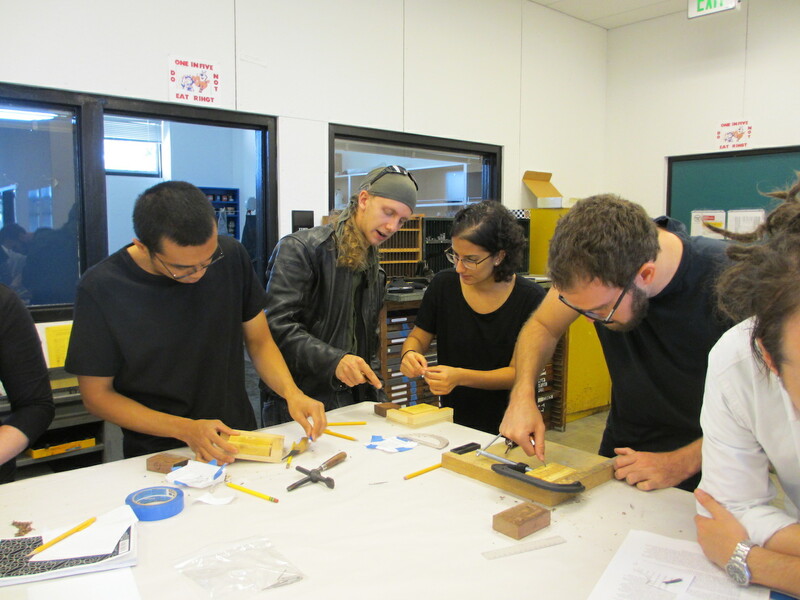 Under the tutelage of historic preservationist William Palmer, our “Making of a Broadside Ballad” team gathered in one of the art studios at the University of California, Santa Barbara, to carve our own woodblocks (see Figure 16). My proposed design was drawn from a linoleum block that I had carved during my earlier period of practicing woodcarving on linoleum blocks: a white ermine next to a crown, with “ER” carved above it. This design was inspired by the Ermine Portrait of Queen Elizabeth I (see Figure 17). In addition to the ermine, I added a crown that mimics Elizabeth’s coronation crown, a reversed “ER” (for “Elizabeth Regina”), and a border that is akin to many of the borders in the woodcut impressions on broadside ballads, such as those in Figures 14 and 15. The image was an homage to Elizabeth I and her symbol of purity, the white ermine. 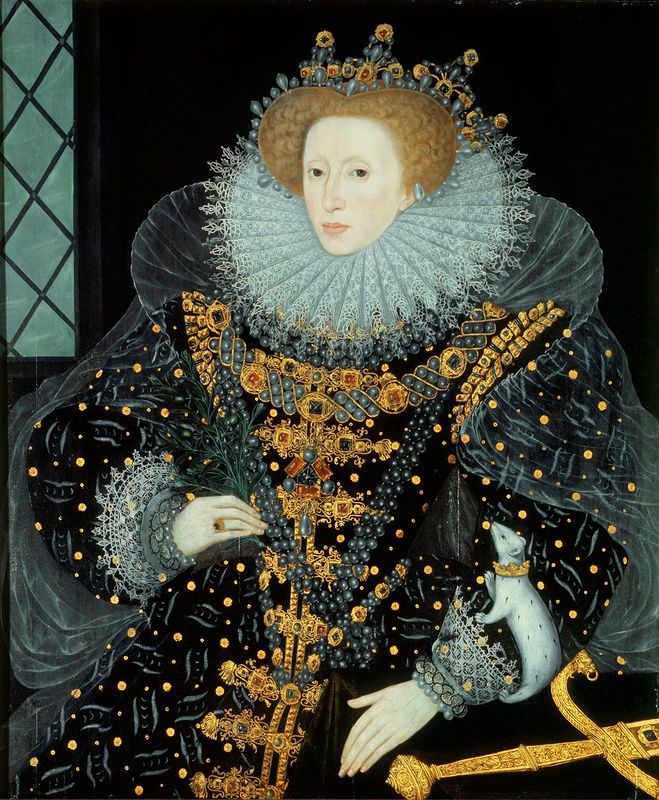 Figure 17: Queen Elizabeth I in the "Ermine Portrait." Palmer opened the woodcutting session with a lesson in carving; few of us had carved wood before, although my practice on linoleum blocks had given me some insight into the woodcutting process. 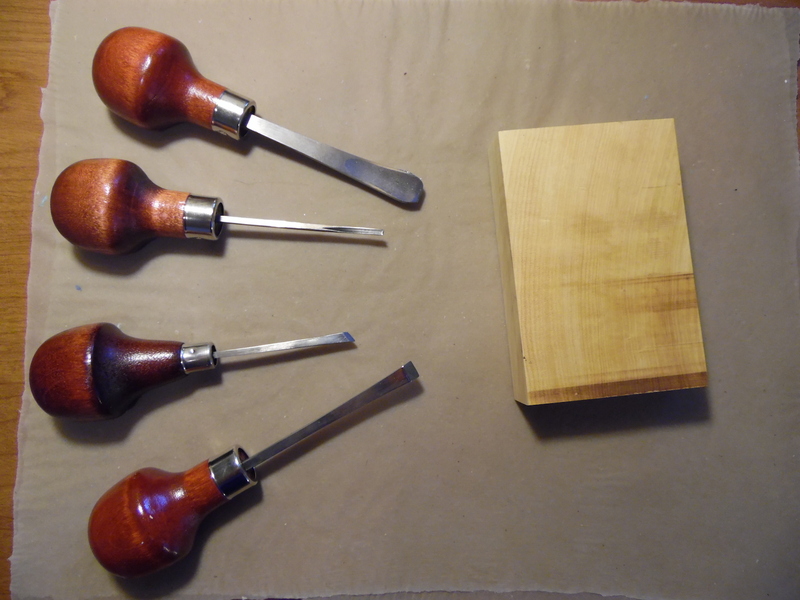 After instructions about how to hold the tools (the chisel, for example, is held much like a pencil) and how to make basic cuts using a beveled chisel (the second tool from the top in Figure 18), we began to practice on some walnut blocks that Palmer had brought for that purpose. The walnut blocks were rough; cutting on them was not difficult, as they were fairly soft, but the real difficulty lay in working with and against the grain to make even the simplest cuts. It was easy to accidentally lift up entire sections of the wood when trying to carve finer areas, causing the carver to lose entire lines. I began by carving out the blank space between the border and the window, which would appear on the right side of the image when impressed. To carve, I used the corner of the beveled chisel to score the line that would form the inside edge of the border; I then used the flat edge of the chisel to carefully peel layers of the blank space up to the line that I had scored. In contrast to my work with linoleum, when carving the woodblock, the beveled chisel was the tool I used most frequently; I only reached for a V-shaped chisel to create some fine lines. I was expecting to find the wood difficult to carve, especially after working with linoleum; however, the wood itself was surprisingly pliable. In fact, that made the process more difficult, as the tools slipped frequently, creating unwanted lines across my uncarved portions and, on occasion, breaking off or peeling away chunks of them. I learned to move very slowly, make small cuts, and work around mistakes. I cut myself once (and I was certainly not the only member of our group to do so), and after a few hours my fingers were terribly sore from holding and pressing the chisel. As I was standing for nearly five hours bent over a workbench, my back and neck were in agony. A brief glance at Amman’s image of the woodcarver shows a man curled over a workbench in much the same position we occupied for hours (see Figure 1); it was taxing work. After nearly five hours (over twice the amount of time that I had spent carving the linoleum version of my ermine block), my woodcarving was complete. It lacked some of the intricate details of my carved linoleum block, simply because I had to cut the wood deeper so it would still print under the immense pressure to which it would be subjected in the printing press. But the image was recognizable, and the block joined a line with the three other blocks we had decided to use for our broadside ballad: my ermine image; the partial title and musical notation of our ballad tune, “Auld Long Syne” (spelled with a long “s” for “Syne”); a skeleton and a woman holding a sheet of paper; and a dancing skeleton holding a printed ballad, with a pair of carved geometric border ornaments set above and below it (see Figure 21). The final image of our printed ballad (see Figure 22) demonstrates our success as amateur woodcarvers. Our ballad takes the form of what we have called “heyday ballads”: four columns of verse printed in ornamental black-letter type in what we would now call landscape format, with a large title above the first two columns, many illustrations, and a printed tune title. Each column has a woodcut impression above it, as was typical of heyday ballads. Like the ballads that proliferate in libraries and databases, there are at times loose connections between the images and the ballads themselves; my own woodcut impression invites speculation into the nostalgia often embodied in the archaic formats of heyday ballads (for instance, their continued deployment of black-letter type long after roman type replaced it in most of the printing world). In this case, my Elizabethan ermine not only hearkens back to the time of Elizabeth (which would have been in the distant past during the time of the heyday ballads), but also imitates the ballads’ tendencies to employ archaic dress in their woodcuts, as well as their use of black-letter font. The other woodcuts on our ballad perform different functions. Two of them feature skeletons: a single dancing skeleton carved by Phillip Cortes, and a skeleton and woman pairing carved by Patricia Fumerton, Andrew Griffin, and Carl Stahmer. While skeletons were a common motif in ballad images (see for instance, “Deaths Dance,” Pepys 1.56-57,EBBA 20263), we also had intended our skeletons to conjure up images of our ballad-makers being worked to death in the various tasks that comprise the making of a broadside ballad. They evoke the intense amount of labor required by the creation of a single ballad, from making the paper, to writing the verse, to applying a tune, to cutting the woodcuts, to setting the type and cuts together on the printing bed, and finally printing the ballad onto the made paper. The last woodcut illustration, featuring the musical notes of the ballad tune “Auld Long Syne,” once again turns to nostalgia through the very title of the ballad’s tune. The production of this particular woodcut, even more than my ermine image, demonstrates the need for the cutter to be particularly careful in reversing the image so that it will print correctly. Not only the words but also the musical notes needed to be precisely reversed in order to print in the correct order. Our carver, Erik Bell, is a skilled musicologist and not only successfully carved the correct notes but skillfully reversed the image so that it would print correctly. In spite of our planning, we ran into difficulties when we took our woodblocks, ballad text, and paper to the printing lab at the University of California, Riverside to print our ballad. The woodcuts posed a special challenge. There were slight variations in size that did not correspond to the height of the metal type, and being a different medium, they took both pressure and ink differently. Only in printing did we also realize that the block on which Erik Bell carved the title of the tune was slightly lower due to the way it had been sliced by the carpenter, and thus would not catch ink. A closer glance at our completed ballad (Figure 22) shows uneven inking and pressure throughout, but particularly on the woodcut impressions. Such unevenness is equally visible on the ballads in EBBA’s archive; it appears that early modern printers wrestled with the same issues, yet sold their ballads anyway. Such a fact speaks once again to an artistry that seems divorced from notions of aesthetic perfection. These ballads are not “perfect” in any way, yet their dissemination in the seventeenth century by the millions and their survival by the thousands in collections across the world demonstrate their popularity with early modern audiences in spite of their imperfections. It seems that ballads, in spite of the crudity of their printed images, made a desirable and lasting impression on the English public. Making a woodcut reveals the artistry inherent in the woodcarving process, even of the most imperfect of images, like our poor Celinda in Figure 14. This particular image has also evoked in modern viewers what many woodcut impressions would have evoked in the viewers of their time: both nostalgia for the past and an awareness of the social life of ballads. Woodcut images were a form of communication, extending from craftsmen (artists, woodcutters, printers), to the general public, to the most affluent and highest echelons of society (many of whose members assiduously collected, catalogued, and maintained the ballads that are extant today). Moreover, a hands-on understanding of the process of making a ballad not only illuminates the production of the objects we study, but also allows for commentary on the political ramifications of inhabiting the space of the artist rather than just the scholar, left only with the traces of these methods of production. In fact, such an endeavor calls for a renewed interest in the artistry of ballads, which were so clearly art objects to their contemporary audiences, as their decorative uses demonstrate. A deeper understanding of the creation of woodcuts allows for a (re)appreciation of the auratic qualities of both woodcuts and their impressions, and for a recognition of their value to scholarly inquiry. Discussion of "Making an Impression: Creating the Woodcut in Early Modern Broadside Ballads"
Version 26 id 985 of this page, updated 03 February 2016 by Kristy McCants. Created by Brian Reynolds.